This promotional effort brought the best of the destinations to 200 travel agents with the intention of promoting the already strong airlift within this, the number one state of origin for tourists from the US to the region. The California Tour, part of the region’s Joint Promotional Campaign, took place from June 28-30 with the participation of the promotions offices of the Riviera Nayarit Convention and Visitors Bureau (CVB) and the Puerto Vallarta Tourism Trust. “We went to boost the upcoming vacation season into taking advantage of the excellent airlift we have in this area, where these top cities boast direct flights year round,” said Marc Murphy, Managing Director of the Riviera Nayarit Convention and Visitors Bureau. Three Dinner Seminars were held in San Francisco, Los Angeles and Newport Beach, California (the latter is located in Orange County), reaching a total of 200 trained travel agents. The above mentioned airlift includes Alaska Airlines, which flies from all three cities; United Airlines, flying in from San Francisco; Delta Airlines, with flights from Los Angeles; and Southwest, which departs from Orange County, with a second possible flight coming up soon from Los Angeles. The objective of the tour was also to lavish attention on California, the top state of origin for tourists from the United States to the Riviera Nayarit. This is also one of the most important markets for the destinations thanks to its economic potential, which meshes nicely with the luxurious and exclusive hotel offer that continues to grow—the most recent example being the inauguration of the W Punta de Mita hotel. 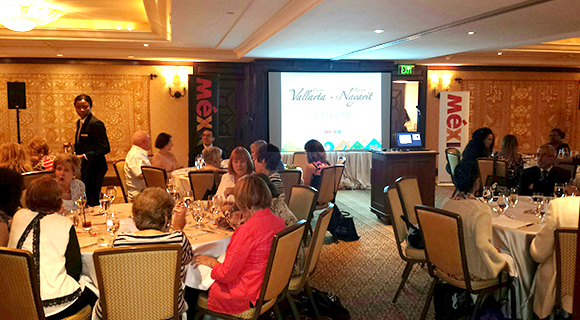 The California Tour had the full support of the Los Angeles office of the Mexico Tourism Board (MTB) for the three events. Six tour operators and the above named airlines also participated. Aeromexico, Interjet and Volaris were part of the California Tour as well, plus a total of 24 hotels from the region, which can always be counted on for their participation.